This battery-powered hedge trimmer bundle comes standard with battery and charger, and combines great power and long run times. Part of the STIHL Lightning Battery System™ line of products, the HSA 56 hedge trimmer delivers exceptional performance and value. It is portable and lightweight at only 8.1 lbs. (including battery), while also packing a performance punch. It features a high cutting speed of 2,800 strokes per minute, slicing through overgrown hedges with minimal vibration. Trim the length of three football fields on a single charge – that’s up to 1,000 feet. And when you’re done, just hang it on the wall from its onboard hanging slot. 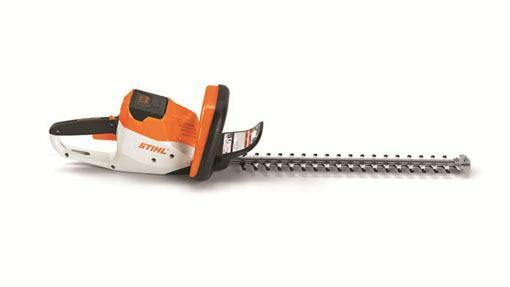 It’s a great STIHL AK Series hedge trimmer for suburban yard care. The HSA 56 hedge trimmer bundle comes standard with the AK 10 battery and AL 101 battery charger. The HSA 56 is also available as a stand-alone unit without battery and charger.